The Deck of Influence has 55 cards, each with full-color art by Michael Lee Lunsford, layout by Daniel Solis, and text by Brendan Conway, with a tuckbox by Sarah Richardson. It includes 30 Influence cards in five different sets, one for each PC at your table. When someone has Influence over you, you can just hand them one of your cards, and they’ll have a special reminder with cool art and all the rules they need in an easy to reference form. Also included are 25 condition cards, reflecting each of the five conditions in Masks: Afraid, Angry, Guilty, Hopeless, and Insecure. Each kind of card has its own art and rules for using conditions. The Deck of Influence will not only spruce up your table, but will make your game run as smoothly as possible! 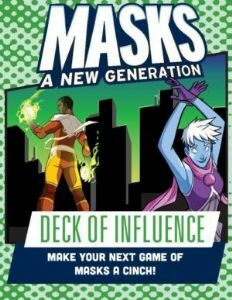 Masks: A New Generation is a superhero roleplaying game in which a team of young heroes fights villains, saves lives, and tries to figure out who they are. The Deck of Villainy will ensure your heroes have nary a safe moment from the dastardly threats to Halcyon City! The Halcyon City Herald Collection is a sourcebook for Masks: A New Generation that fleshes out Halcyon City with new places, new faces, and new mysteries. Secrets of A.E.G.I.S. is a sourcebook for the roleplaying game Masks: A New Generation that fleshes out the metahuman covert law enforcement agency, A.E.G.I.S., with new details and new ways to play the game. Unbound is a sourcebook for the roleplaying game Masks: A New Generation that shows off four new and different ways to play Masks.